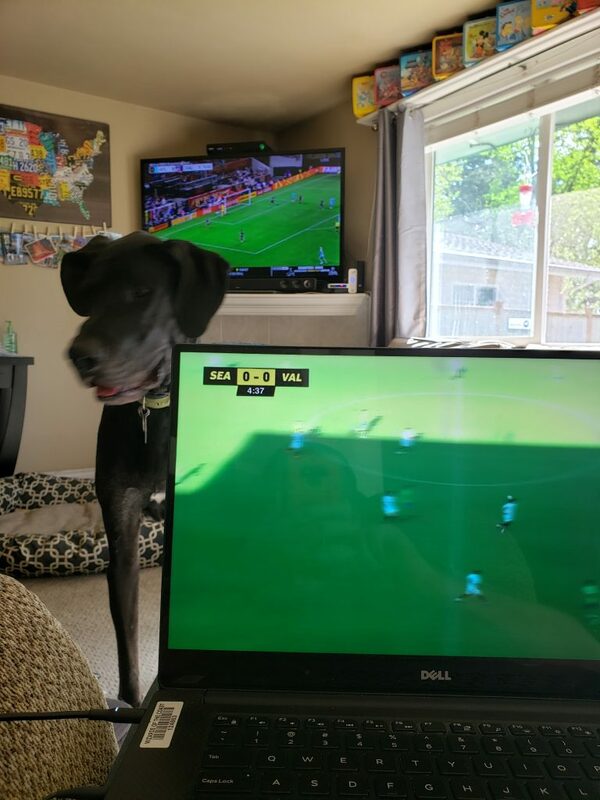 My common sort of view with soccer on the TV as well as on the laptop, and frequently Elwood decides to stand in front of me and just watch me as I watch soccer or use the laptop. I run a weekly D&D game with friends. 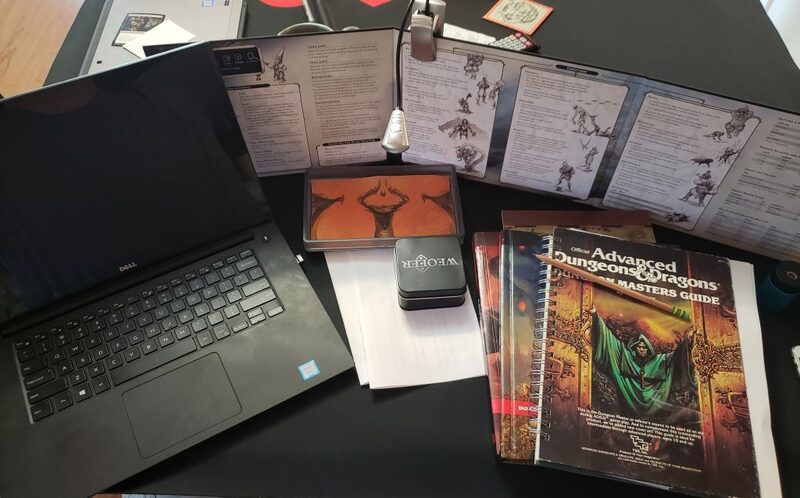 I shared this online a few weeks ago, as a peek at my DM kit. That ADND book is a spiral notebook that reuses the cover of that classic book, one of my favorite things! Shen Wei, “The Vagrant Master”, a homeless man in China who is learned in philosophy and quotes Confucios, Dante and Aristotle, has fled his home area of Shanghai as he gained unwanted Internet fame. Watching a fighter jet takeoff, with an unexpected end. Baby gorilla’s first chest thump. Adorable. A fascinating look at Stephen Wolfram’s daily setup and gear. 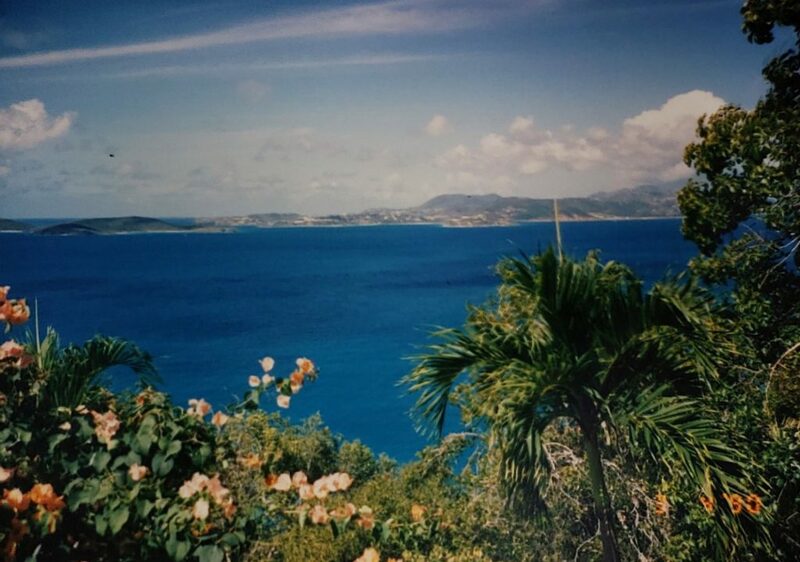 A photo taken by my (I presume) father on a trip he and my mom went on back in 1990. Unfortunately I can’t ask them where it was taken, but it sure looks like a nice place to visit. Norway’s $1 Trillion Man Talks Brexit, China and Big Tech. An interview with Yngve Slyngstad. BM: What do you make of [Big Tech] share prices? Boy Meets World was a major show from my childhood. I vividly remember watching it and how cool the older brother Eric was. Well, having grown up, I have learned more about Will Friedle thanks to his involvement with Critical Role. Here’s a great interview done as part of their Between the Sheets show that dives into his life, anxiety, and who he is..
For 2019, I decided to quit soda. And it was shockingly easy this time. I did this before and ended up relapsing but I’ve really tackled it anew this year. Before you say it, I know some of these drinks have a lot of sugar. That’s the point. I’ve been quitting soda primarily to get me off of caffeine. Cutting back on sugar is coming next. But what actually made me want to write this post is that I’m currently sitting in a hotel room, of which one of my travel routines is to enjoy a bottle of Pepsi while watching streams in the hotel. It has no sense it’s just a thing I’ve found myself doing while I travel and today as I sit in this hotel room I was struck by a real wanting for soda – something I haven’t truly faced since I stopped drinking soda. Ah the joys of the human mind. Thoughts on the Movies, TV and Books I've consumed recently. It is a weird movie, framed as an action. And sure there is some. But it’s much more of one about the human condition and greed. Enjoyable, and Rami Malek truly does give a stunning performance. I didn’t love the movie, but the soundtrack is amazing as you’d expect. A funny and touching movie about one girl’s journey, and her family, from Norwich England to the WWE, based on a true story. I had read the first series of these comics a year or so ago and I really enjoyed this series. It has campiness and some cringe moments but overall a very fun ride for this first season. A dumb comedy that made me laugh a lot. Rating: 28/30 years of tag. I was only so-so on the first season, but I have really been enjoying the second season. Just did a rewatch of Season 1 and there was so much I had forgotten. Parts still age fantastically and the cliff hanger caught me completely off guard. I had forgotten all about it. Rating: So Say We All.